When tabloids and blogs transformed regular old freakshow trainwreck Nadya Suleman into The Octomom, my thoughts went to video games. 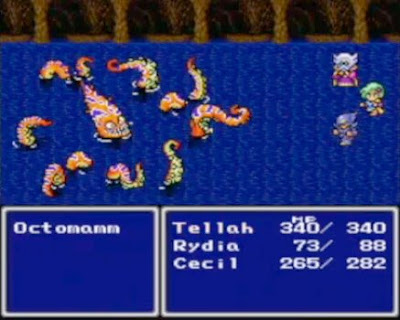 Rare though by position may be at the cross-section of tabloid browsers and game geeks, I’m sure I wasn’t the only one, as the initial translation of Final Fantasy IV featured a gruesome octopus boss named Octomamm. Now that I think about it, Octomamm is a strange name for such a character. (It is, I suppose, better than Octoma’am. Sure enough, it wasn’t the creators initial choice and only came to exist in the game’s English version as a result of the limited space available for character names. In the original Japanese version called the monster Octomammoth, and this better, longer, and slightly more sensical name appeared in subsequent remakes. 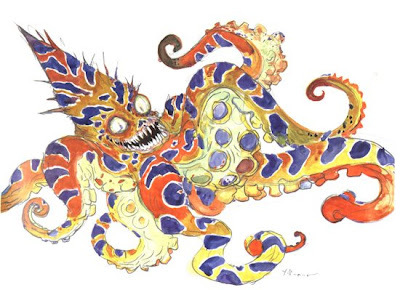 In looking this up, I stumbled across some concept art Yoshitaka Amano drew up for this boss in particular. Pretty damn horrifying, though less so than many third-trimester photos of Octomom herself. Ha ha. 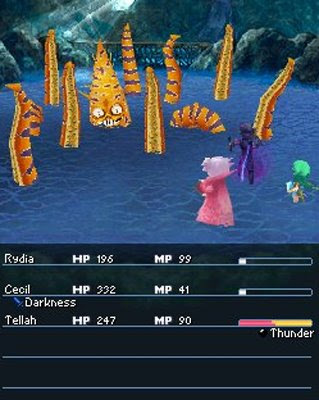 I too thought of the octopus from FFIV (II US). Nice. I agree, that lady is a retarded reality star. But aren't they all? Well, yeah. I'm glad to know I'm not the only one who thought of this.